There are a number of good reasons to start a business but for Rod and Mal Paterson, a longing for “down home food” definitely topped the list. Long time farmers and sausage makers in East Transvaal, South Africa, part of the experience that comes with getting used to a new life and culture included adapting to new food. Try as they did, they simply were unable to find the one food they couldn’t replace. It’s known as “biltong” and according to Rod, nothing quite substituted for its unique flavour. The Patersons came to Canada in 2003; three years later they launched their business. 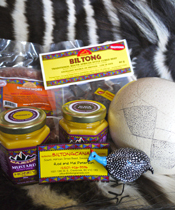 Albeit not without its challenges, Biltong Canada has continued to grow through on-line sales, attendance at farmers markets and in their latest marketing strategy, Taste of Africa tasting parties. It was implementing a food safety system, however, that provided an added measure of confidence for the couple and the company. “That allowed us to enter the wholesale market; we hadn’t been in that section before. This is a whole new experience and we have the confidence that we are doing it the correct way,” Rod replied. The decision also allowed them to upgrade plant facilities by stepping up from a cold chain that included eight chest freezers to installing a walk-in freezer room. That has allowed us to buy our meat in bulk and that certainly will have financial benefits,” he noted. In addition to the freezer and the entrance into the wholesale market, the intangible but vital benefit of operational streamlining is a major advantage. Discussing every aspect of the business and creating operating guidelines enabled them and their employees to identify “what worked”, what practices needed to be changed and how traceability and affordability could be put into place. Rod noted they had taken food safety courses in the past but with the assistance of SSFPA, they took the “next step up”. As a result of what they learned, they were not only more knowledgeable about controls on hygiene and cleanliness but able to apply them to every step of their business. Being able to access funding and support through the SSFPA program has enabled the Patersons to improve and expand the scope of their dream. He recalls his first experience, after arriving in Canada, of having to buy meat over the counter. 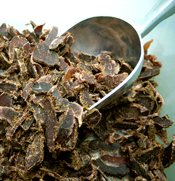 “I was dreaming of biltong and when we couldn’t find it, we decided to make it ourselves. We looked on-line and saw that it was a huge industry in the United Kingdom but there was nothing exactly like it in Canada,” he says. Making the product came about as the result of Rod and Mal’s vision and skill, making it under the strictest of safety controls and traceability standards was achieved with the support and guidance of SSFPA. It’s proving to be a great equation: one company plus one great program equals a tasty success. Watch short interviews with Rod and Mal Paterson.